The average college student graduates with more than $20,000 in student loan debt, and hopefully, your reliance was less than this. 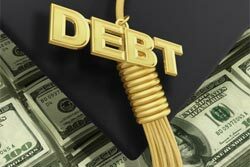 However, regardless of your level of student loan debt, you will want to do whatever you can to pay off these debts as quickly as possible. The strain that student loans put on your daily finances is significant, and once you eliminate this debt, you can focus on other important aspects of your financial future, such as your retirement fund and your kids' college fund. If you implement a few common sense strategies and are willing to be diligent, you can get these loans paid off in a short period of time and begin to live a more financially fulfilling life. If you have private student loans, this is not an option. However, for your federal loans, never apply for deferment or forbearance. You'll simply be prolonging the inevitable. Of course, if you have yet to find work and you have no other option, then you can take advantage of deferment; however, far too many people abuse this course of action. If you've got the means to pay the money back, then do so. Do not let an uncertain job market force you into accepting less for a job that you know pays more. Research salaries online for the industry and career you're interested in, and use this information when it comes time to negotiate your salary. Having as much capital as possible on hand is always a good way to quickly pay down student loan debt. You may be able to save by consolidating your private or federal loans. Research the interest rates on your private student loans, and visit your bank to see if they can save you money. For federal loans, the interest rate will be a weighted average of the current interest rates on the loans you have, capped at 8.25%. There are online calculators available to estimate what your new interest rate might be. If you do consolidate, do not extend the terms of repayment. This will negate any up-front savings you receive, and you'll end up paying more over the life of the loan. The thought of carrying a student loan balance for 10 or 15 years after your graduate makes no sense. In order to make more than the minimum monthly payment, you'll have to tighten your belt financially. To do this, postpone any major purchases in your life until these debts are gone. Furthermore, save on smaller purchases too: Clip coupons to save on grocery shopping, and review your monthly bills to see if switching to another provider will save you money on your cell phone, Internet, or your cable or satellite TV package. Once you've got the extra money to spend, plan a time-frame for when you expect to have your debts paid off. Review this budget occasionally to make sure you're still on track. You can also apply any "bonus" money you earn or receive throughout the year to your debts, whether work-related commission, cash gifts, rebates, or any other unexpected funds. Though paying off your student loan debt should be your priority, do not completely put off saving for retirement or investing for your children's education. If the interest rate on one of your student loans is 4%, but you can invest in a Roth IRA that yields a 7% return on your investment, you can see why you can still do both. Put together a modest retirement portfolio, and once your debts are paid off, you can then begin to contribute more. As long as you remain steadfast and have a plan in place, there's no reason why you can't quickly pay off your student loan debts. What plans do you have for paying back your student loans? Indeed a very sound tips! Excellent post. Thanks.